I was accepted by lottery to race in the 4.4 mile swim across the Chesapeake Bay in early 2017, so I spent the next six months training for it, which included a 100x100 workout with some friends about a month before the race. I completed the Bay Swim in 2015 with a wetsuit but without much training. 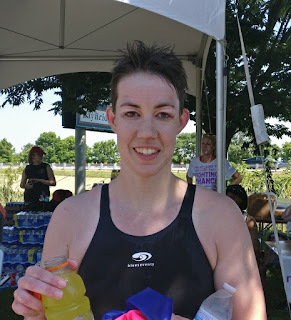 I did well, though, getting 2nd place in my age group and finishing under two hours, but mid-way through my shoulder gave out and I spent the rest of the summer rehabbing it. Sunday, June 11 was the perfect day for an open water swim. It was in the 90s, clear, sunny. The water temperature was about 71 degrees, so I didn’t need a wetsuit for warmth. My boyfriend drove to the event with me in the morning. We parked and then got on separate shuttles—he to the finish line and me to the start—and didn’t see each other again until I finished the race over three hours later. I’m so grateful when family and friends come to support me at these events, and a little baffled that they’re willing to wait for so many hours when they only see me compete for a few seconds. Even if I can’t see them for most of the day, it’s very comforting to know they’re there. I found some swimming friends on the shuttle and sat with them in a shady spot at Sandy Point State Park after we checked in and while waited for the start of the second wave of swimmers. Although I had swum it before, my nerves kicked in—the excited kind! I had trained, prepared as much as I could with the time I had. So I just had to get in there and trust the training. At the start, I was relieved when I felt the water: nice and cool and refreshing. I swam a little crooked, I think, getting out to the bridge from the shore, but then was able to swim relatively straight. We were meant to use the two bridges as lane ropes: stay between them at all times or get disqualified. I hugged the left side until about ¾ of the way through, then hugged the right side till the end. The water was calm enough, though it did get wavy. There were long stretches when every time I tried to breathe to the side, I got a face full of water in my mouth. So I’d have to look straight up to breathe instead. My right hand went numb about half way through. And my left shoulder started to twinge around mile three. But otherwise, I felt great. I just kept swimming, stroke after stroke after stroke. When I got to shore at Hemingway Marina’s beach, I ran (sort of) up a small hill to go through the finish line. Remembering how I had a dirt beard the last time I swam it, I tried to wipe it off as the volunteers collected my timing chip from my ankle and paper number out of my swimming cap. I walked through the gauntlet of spectators to get to the food tables where I downed a bottle of Gatorade, a bottle of water, a 6-inch sub, and two chocolate donuts all within about five minutes. My boyfriend found me as I was getting water, congratulated and embraced me, and then told me I was filthy. Get it off! I said. With what? he asked. He said he needed to take a photo first, which he did, then he wiped the dirt off of my face with his bare hands. So, did I meet my goals this year? My shoulders ached for a few days after the race, but it was just muscle soreness and I was back to normal about a week later. I did not wear a wetsuit, which, again, made me slower but it was more comfortable. I went under two hours again, and did almost the exact time I had done in 2015 1:56:58. And I won my age group! Congrats for meeting/exceeding your goals!! It's so cool that you can do these things... all the time & effort & training & sweating that goes into your prep. You are a rockstar! Congrats.